Wantrepreneurs think the business revolves around them. Entrepreneurs believe in themselves, in their team. They know they can’t do it alone, that their team is essential for the growth and success of the business. Entrepreneurs make things happen, no matter how small a step forward it is. Wantrepreneurs are always looking for excuses and complain when it gets hard to get going. Entrepreneurs carry on, learn from their mistakes and work it off. Thomas Edison kept working on discovering the light bulb after failing 1,000 times. 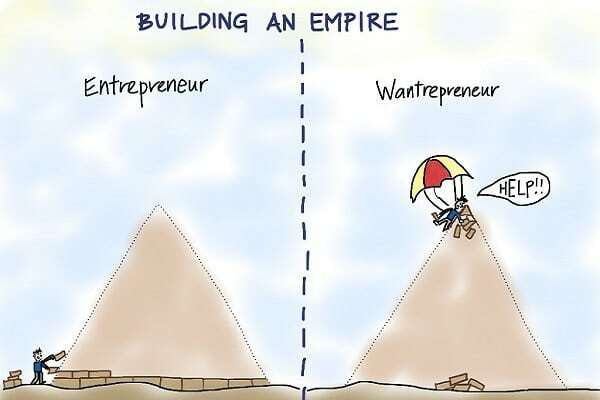 Wantrepreneurs get discouraged and stop altogether. Entrepreneurs work to be the best in their industry, to leave their mark on the world. They believe in the adage passion before profits. Money to them is just a side benefit, a prize for doing a good job. Wantrepreneurs work only for the money. Entrepreneurs work hard to make their business a success. They’re too busy with working to worry about what other people think about them. Wantrepreneurs don’t have the patience to work on the business. They look for shortcuts and prefer to spend their time making people think they are already a success. True entrepreneurs do not wait for funding or additional resources to start and keep on going. They find ways to raise capital and work to get additional funds. Wantrepreneurs don’t do anything until they get the capital they think they need to get the business off the ground. When there are changes in the business environment, entrepreneurs are able to act quickly to adapt, and often times finding opportunities in the change, whether it is a better way of doing something or tapping a previously unknown market. Wantrepreneurs are often shaken by change and are too busy discussing every little aspect of a change during meetings to adjust on the changes. Therefore they are often left behind. Entrepreneurs don’t wait for the perfect idea to come to their mind. They know it doesn’t have to be original or unique to make it successful. Often the best idea is seeing the gap or the need to improve on what already exists. And a lot of successful businesses started with the entrepreneur needing something he/she couldn’t find anywhere. Wantrepreneurs, on the other hand, obsess about finding the right idea or the next big trend that will get them rich quickly. The business world is tough and only a handful survive the cutthroat arena. Entrepreneurs are not afraid to risk their funds, image, or business because they believe in their business, their product. They know the risks involved and yet they put out. Wantrepreneurs would rather bet on a sure thing. An entrepreneur is driven by his passion for his business. It is something he loves to do, something he believes in. Wantrepreneurs follow the trend, simply because it has proven successful already. Top 5 Reasons Your Email Fail!